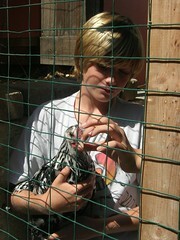 The Cluck Trek yielded attendance of over 100 people including plenty of children. The event was publicized through multiple small community newspapers, through our internal Transition email loops, and through L.A.'s chicken meetup group. From there, the message spread as people cross-posted it. The organization of the event was relatively simple: we found 3 neighbors who kept chickens and asked them if they would be on the tour. These didn't need to be fancy, artsy coops like are seen on some tours; instead ours were very practical, normal kind of coops. Although after the date was established, we begged another coop owner with a really cool split-level, hillside-integrated coop to allow us to put it on tour. And another coop owner in the neighborhood -- who we didn't even know before -- sent us an adorable video of her chickens and site and asked to be included! Great networking! For the day of the event, we prepared a map of where the coops were located. We had publicized a neutral map-pick-up-address so that we weren't putting someone's home into all the newspapers. The morning of the event, volunteers manned the map-pick-up table. We asked for small donations, and had a display of chicken books from the library (as well as the panorama of Transition activities in our local area). The tour itself was designed to be self-guided, and people at the map table encouraged visitors to "mix it up" and visit the coops out of order in attempt to reduce crowds. We also had some basic guidelines set out, such as "no dogs". We provided handwashing stations and asked that visitors avoid walking into the coops -- our attempts to prevent exposing the 5 different flocks to unaccustomed bacteria. Each of the 5 chicken-keeper families stayed home, coopside, to answer chicken Q&A. At more than one home, the tour guides included the family's children. Some of the chicken-keepers had prepared handouts about their chicken activities, and these were available at the individual homes. The edible gardens at these homes also got a lot of visitor attention, as did compost piles, rainbarrels, and solar panels. Four of the coops were within mere blocks of each other, and the fifth on the tour required a car. Thus the owner decided to invite people to bring a potluck lunch in hopes to entice them to make the journey. It really worked, and gave everyone an opportunity to hang out together after the series of coops. Some of the comments I heard included "I thought it would be messy, but when I see what you all have done, it is so very possible at my site." 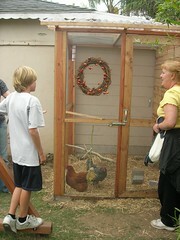 As well as people setting concrete dates ("in the spring") for when they'd bring chickens to their own place. One downside to the arrangements is that the chicken-keepers haven't had a chance to see all the coops (because each one had to be home to greet visitors). And busy calendars might make this difficult to schedule. Thus next time around, there might have to be a "preview day" of sorts.